I grew up in a black-and-white world. 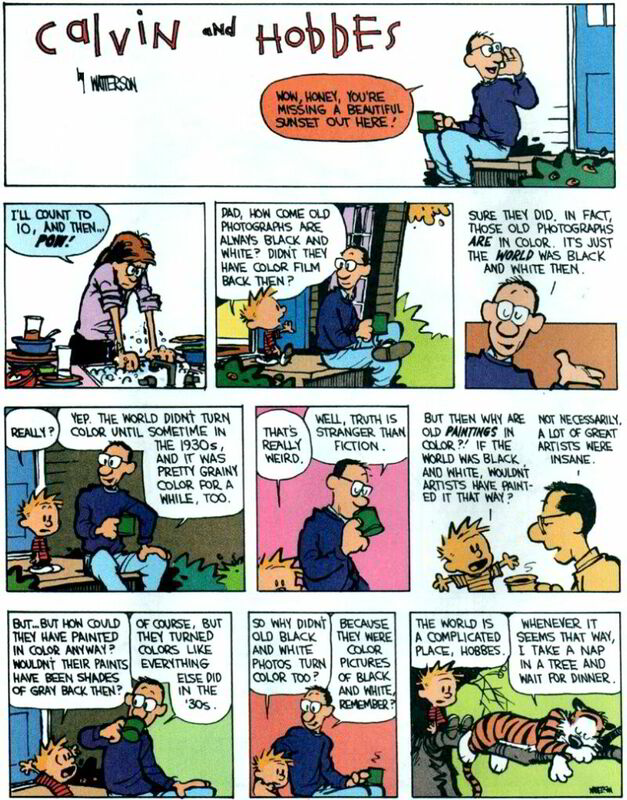 Not exactly like the way Calvin’s dad explained it, but pretty much. When I was very young, television broadcast in black-and-white, and my life was filled with television. Soon, even though technology advanced and broadcasts switched to color, in our house we still only had a black-and-white television. In fact, we didn’t have a color television until I was a teenager, when my grandfather passed away and we inherited his old massive oak-wood RCA Color TV console, with the remote control that sighed like a sulking teenager when you pressed down one of its three buttons. Thus, all my childhood TV viewing was black-and-white, never in color. So how, then did I know that Captain Kirk’s tunic was tan, Spock’s blue, and Scotty’s red? Sure, I suppose my viewing might have been “enhanced” by color pictures in TV Guide, but if that’s so, then why do I also remember To Kill A Mockingbird in color? When I watch the film, naturally I see it in black-and-white, but when I remember scenes, especially scenes from the book that didn’t make it into the movie, I remember them in color. I remember Scout’s red flannel shirt, her dark indigo overalls. Tom’s overalls were faded, as was the blue of his work shirt. Atticus wore suits of pale linen, grey pinstripe, and solid slate grey. Mayella had pink flowers on her dress, while the ones on Calpurnia’s chintz were blue. Perhaps it is because so many things in that story were objects familiar to my youth. The bark of trees we climbed, the denim of our jeans, the thin cotton of our shirts, it was all as it was in the book. Or perhaps it’s because Harper Lee’s words were so simple and direct, so mesmerizing, that I couldn’t help but see the world she created in its entirety, vibrant with color. To Kill a Mockingbird–in both book and film–was important to me when I was young, and it remains so today. Through its story, I discovered fiction that told of kids who were real, not the fantastical wunderkinder that I found in all the other books I was given. It was an adult story told simply, clearly, and with ultimate honesty. Within its pages, I learned that the world is not black and white, right and wrong, but filled with immeasurable greys in which justice can be evil, and wrong-doing can be justice. I learned of the fallibility of mankind, and of the failures in our shared society when we forget that we are not alone in this world. I remember Harper Lee’s classic in color, because it taught me about black and white, because it taught me about grey. I never heard that one before. Brilliant. Rare is the movie that can surpass its literary source for detail and depth. You had me with Calvin & Hobbes.